Home » world's » The Man With the World's Largest Mouth! The Man With the World's Largest Mouth! 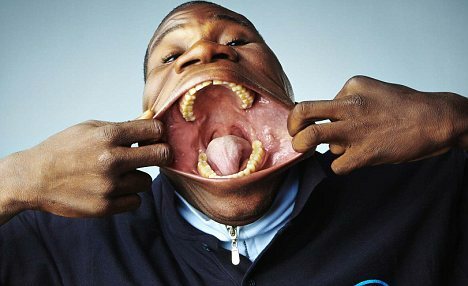 Francisco Domingo Joaquim's 6.69 inches wide mouth has earned him the dubious title of the 'World's Widest Mouth' by the Guinness Book of World Records. His main claim to fame is the ability to put a can of Coke into and out of his mouth with ease as well as spin it around inside his mouth with his tongue. Watch a video here. Read more about him and his amazing mouth here.